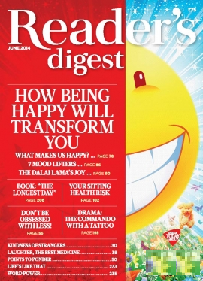 Reader’s Digest – India Edition – June 2013 issue is on the news stand and our subscriber’s copy arrived quite on time. Here are our personal reviews for the same. There are a huge amount of magazine you find on the news stand. And all of them are not what interest us. Here are our personal reviews for the June 2013 issue of Reader’s Digest magazine – India edition. This issue is quite thicker than the regular issue and its found that it has additional pages containing “trusted brand information” as it is the 15th anniversary issue! The cover page shows the face of forgiveness, it promises to bring a heart touching story. When you are tried being killed by someone, will you be able to forgive the assassin(s)? A fellow named Mike Sager did it. In the editorial, the editor, Mohan Sivanand speaks about the article. He came across the Time Magazine’s cover page which was showing Pope John Paul II holding the hand of Ali Agca. It is worth to note that Ali Agca shot the pope which wounded him critically. Later pope after being recovered, went to meet Agca in the prison, hugged him and prayed for him, and of course forgive him! Sometimes we think of such incidents being out of the world and too good be true, but they are the real one. This month’s editorial shows the emotional side of the editor. And yes, the article is not focused on Pope and Agca’s incident, but a similar another incident. Which make us even more curious to read it. Because, Pope is considered as so extra-ordinary person, one may think “Ok this is possible for him to forgive the one who tried harm him, but it is not possible for any other layman”. In the – React – section, readers shows their reaction about the past issues. Naturally the inspirational article about hitting out at Cancer, got good feedback from the readers. Nripjit Chawla’s reply is summarizes the stuff brilliantly, you got to read it. The – here & now – section discusses a lot of stuff but the one we need to mention is, the information about – A fridge powered by water. We often here about the inventions using the alternative sources for energy related works. Be it a vehicle using the alternative energy or a household gadget using the same. But, somehow we later were unable to get the progress of the products. In some cases it is genuinely possible that the solution is not viable for mass production, or the lack of funds and resources needed for the research work, or even the fake claims were made. But, for the rest of the cases, we must doubt that there are viable options for fuel, electricity and other stuffs which are practical and viable. But, the billion $ industry and its holder’s interest got succeed to ground the rise of the same. Well, it is quite possible, and if it is actually happening then it is our being unfair with the nature. When a couple is blessed with a child, the entire center of their lives revolves around him/her. Over the period of time the child grows and moves on in his/her own life, be it study, career or his/her personal life. When this happens the parents find a vacuum in their lives. But life doesn’t stop even for them, so the better thing is to accept the reality and start a new segment of life. Author Padmavathi brings an article on this central thought. An article named – The lighter side of sin – will surely catch your attention mainly due to the article title itself. There are much more to offer in addition when you read the article. In – in my opinion – section the author Adrian Tan raise the issue of education and how can be more realistic and beyond the orthodox limit. The education must shape the skills of the child and prepare him/her to provide his/her full potential to what he/she do later; we think so. One should always keep his mind open. We don’t know that who, why an when present us the guidance. There is an article name – All really need to know – I learned… in which 11 personalities discuss with us that from where did they got some remarkable lessons. We have plenty of places to spend vacation time and wander to. But do you ever encountered with a questions that what are the options the ordinary ancients had? The streets of France are explored in a quick study article. It is a kind of bicycle diary explored. We often say that truth is stranger than the fiction. Kenneth Miller brings a real life drama where people took a wrong turn and got stranded in a desert. There is nothing but the hot environment to accompany them while they are lost and thirsty! How and when they did survive? Singapore is definitely one of the favorite place for a lot of people as their dream place to live (or at least travel through). This lion city is experiencing a cultural renaissance based on the people of diverse cultures living there. Cliff Richards is one of the famous face of Pop music who is survived through various ups and downs during a remarkably long period. You can find an interview with him in this issue of RD. Bittu Sahgal – in his regular – Greenheart – segment brings in the tale of capturing the nature by going easy. The theme of his article is if we leave the creatures alone and stop disturbing them, it is actually our help to them. There is also a small article suggesting not to over-indulge your children. A thoughtful read. The – Outrageous! – section brings information about deaths in custody and how it skips from the knowledge of people. Festivals came to existence with a vision to periodically rejoice the life, otherwise the monotonous life will be burden. However some of the festivals require so much energy and resource to prepare for, pass through, and winding up, that we actually got tired in stead of getting re-inforced with the energy. The – Around the world – segment brings information about some festivals which may make you think same. If you have hear, you can help anybody – is the motto behind the – kindness of strangers – segment. It brings true incidents about normal people who help a stranger just for humanity’s sake. These are the real heroes who makes the society a better place to live. This gesture, it doesn’t matter, how small or big it is, must not get unnoticed and un-praised. Look twice – shows Gourmet fields with a different vision. There is also an article depicting the possible life the ordinary Romans live in ancient times. In addition the regular sections are there including but not limited to humor, quirks, word power and more. The magazine is well balanced between the ideal society and the world as we live in. The cover story may seem very ideal and you may not want to believe it, if not fed with photos and proofs. As the summer is going on, good health tips and how to take care in hot environment is what you expect from the issue, which it doesn’t provide. Overall a nice magazine which gives you value for your money. Rather than reading some skin show oriented magazines, you should read such value oriented magazines.